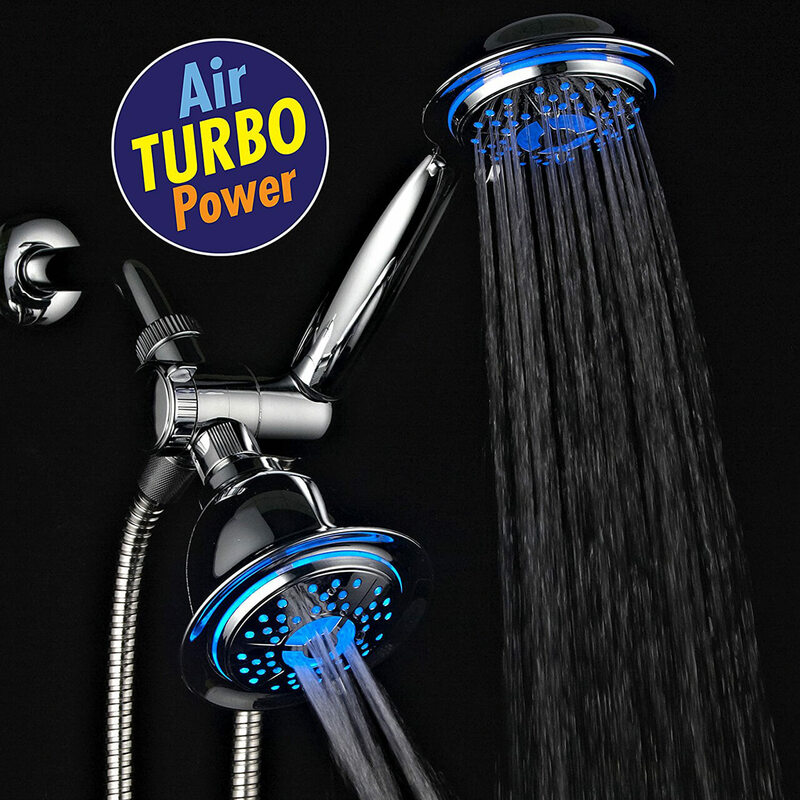 Looking for some of the most technologically advanced shower head ideas? 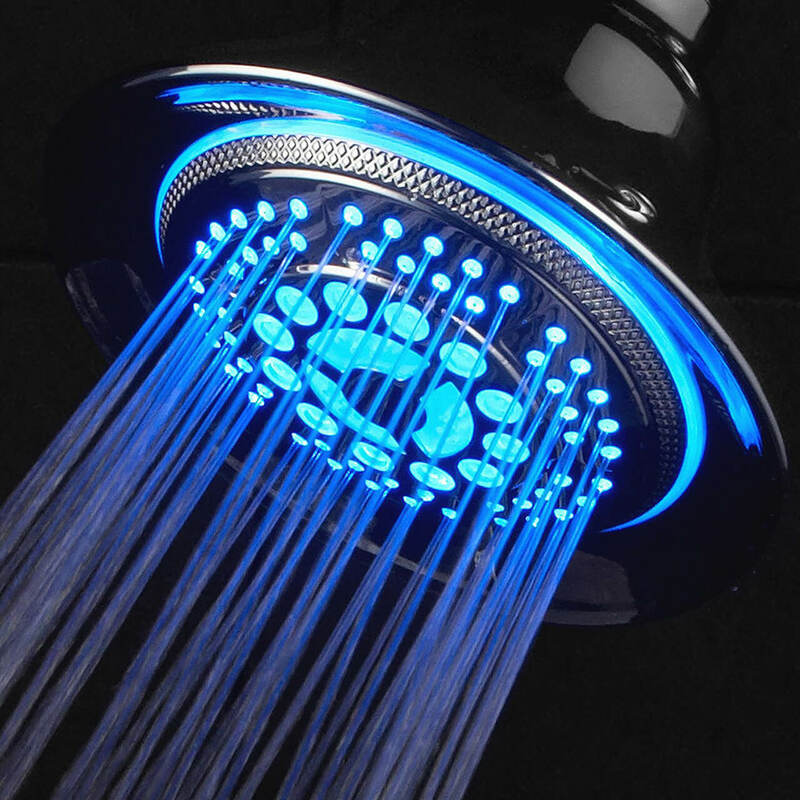 These LED shower heads install instantly without the need for tools and don’t use batteries for their awesome LED light display or LCD temperature notification because they are powered by water pressure. These are all the rage right now and will have kids who need the motivation excited to shower. This chrome fixed-mount shower head has 5 water patterns. The soothing patterns are PowerRain, EconomyRain, Hydro-Mist and Pulsating Massage, and there’s a Water-Saving pause setting. 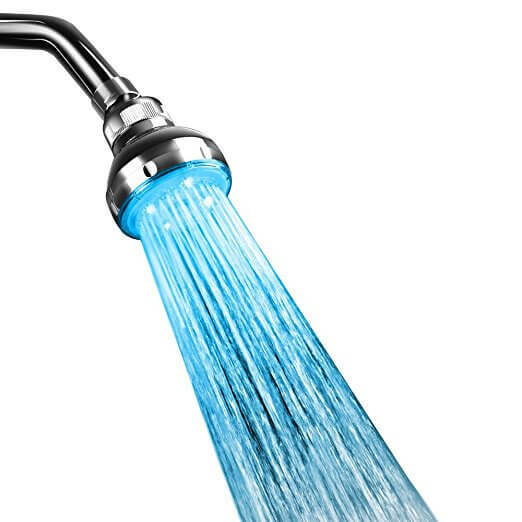 This color changing shower head automatically changes color according to the water temperature, and you can easily rub the spray jets clean removing limescale and ensuring accurate pressure and uninterrupted water flow. 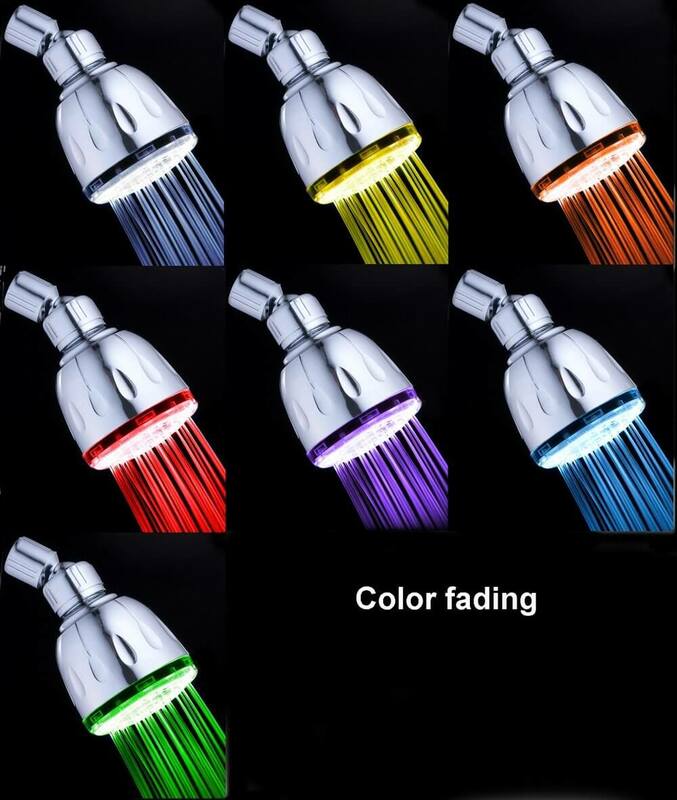 This is a 7-LED color shower head with jet spray. 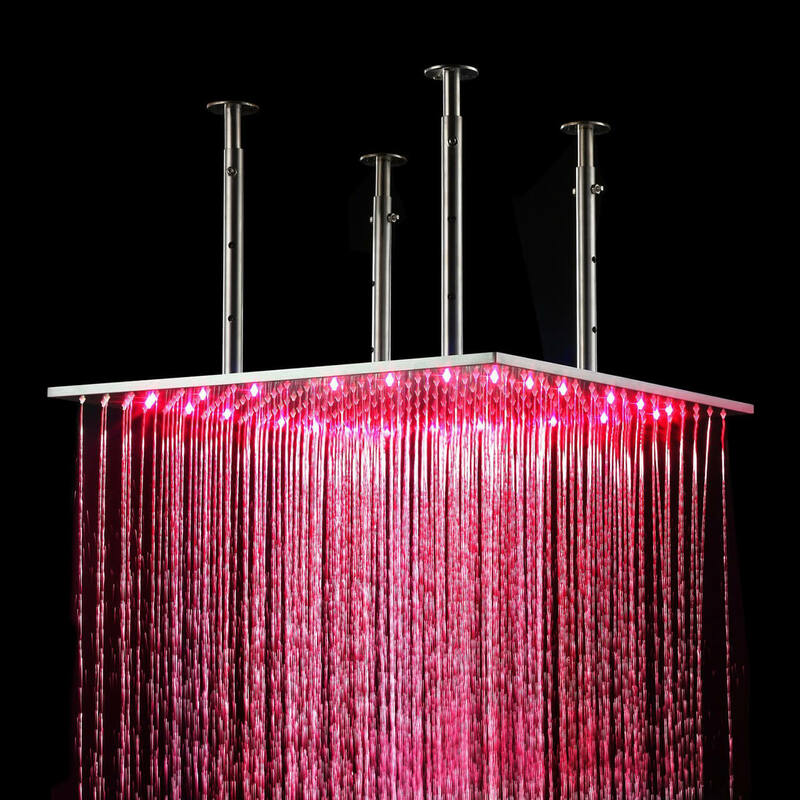 The chrome colored plastic head fits any standard shower pipe, and the LED lighting is powered by water pressure. It works best if you have good water pressure, and has an output of 2.5 gallons of water a minute. 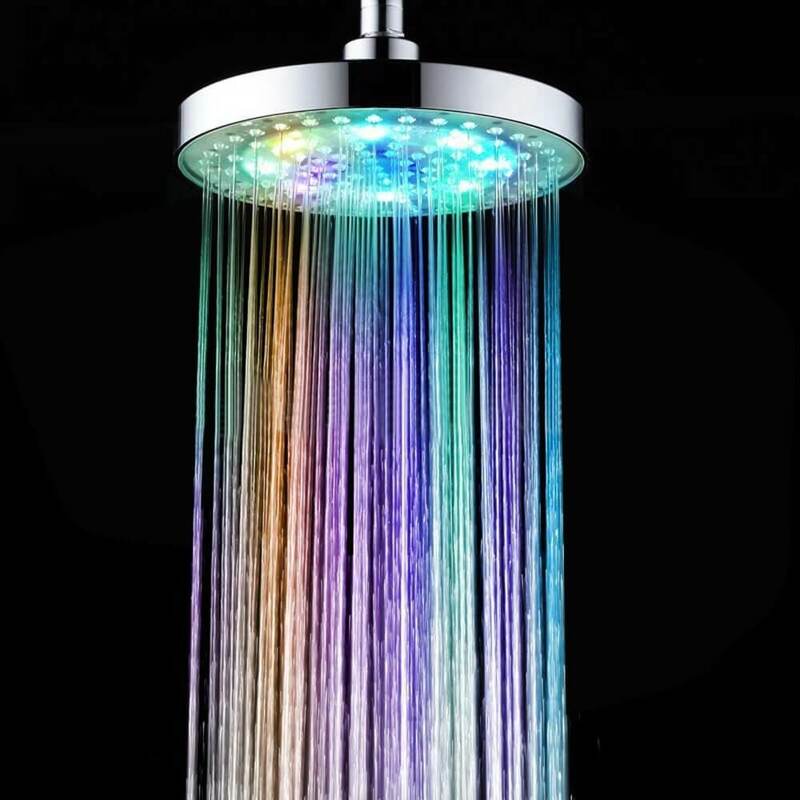 It’s more of a wake-me-up led shower head because the bright colors change quickly disco club fashion. Using this large square ceiling mount fixed shower head from Ouku is like standing under a rain waterfall. 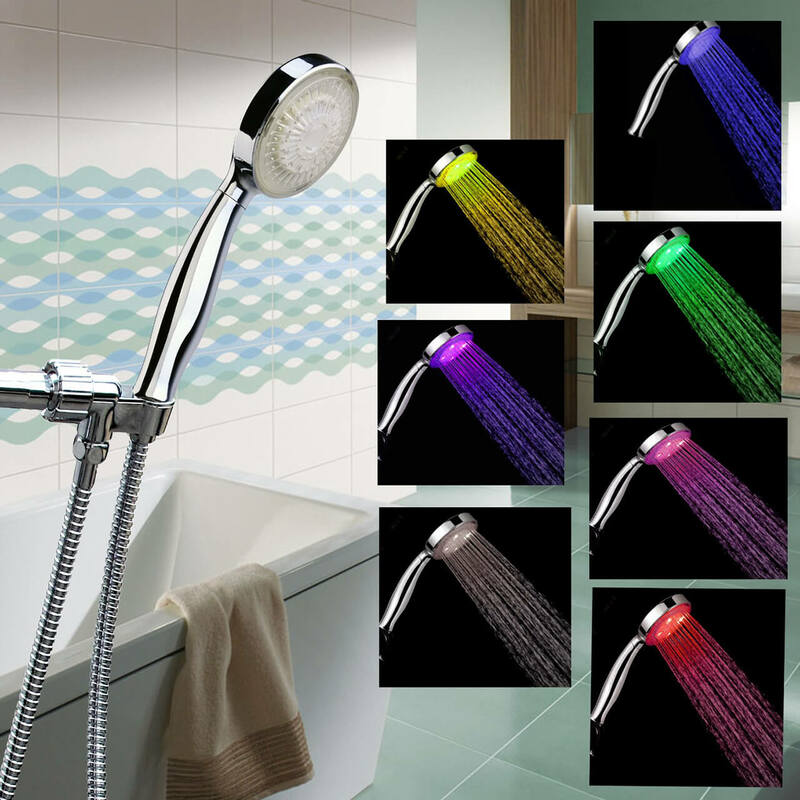 No more stepping into a scalding hot or freezing cold shower with this 12-inch color changing shower head. The light turns blue when the water is cold, purple when it’s warm, red when it’s hot and flashes red when it’s really hot. 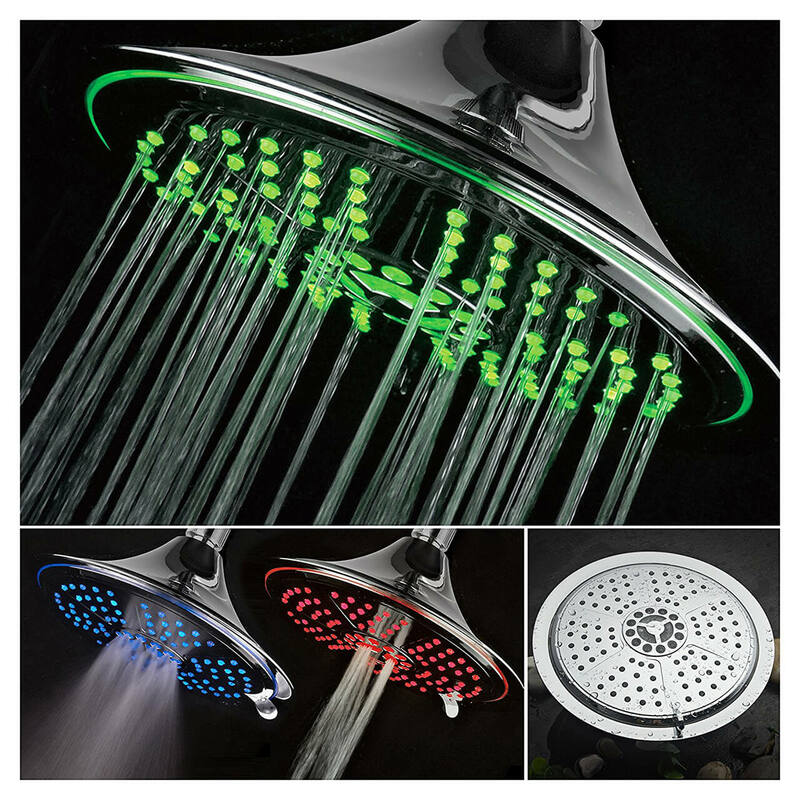 This chrome finished lighted shower head has 3 main LED lights with transitional colors for a relaxing light display as you shower. Enjoy a nice strong spray too, and adjust the head to your liking. Shower under a rainfall with this 8-inch round fixed shower head. 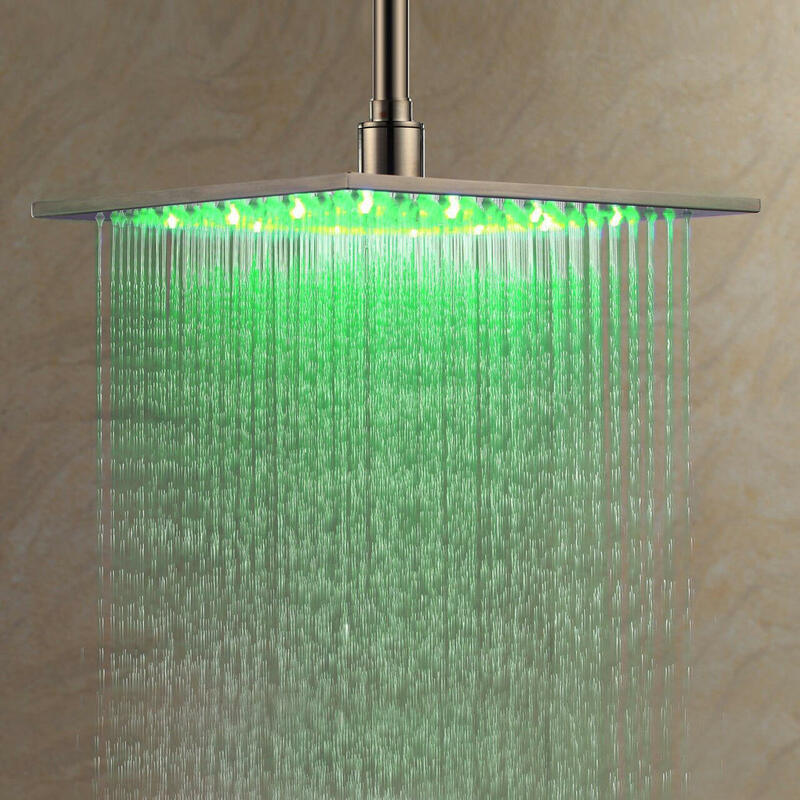 Install it overhead, and shower in a relaxing glow of color. 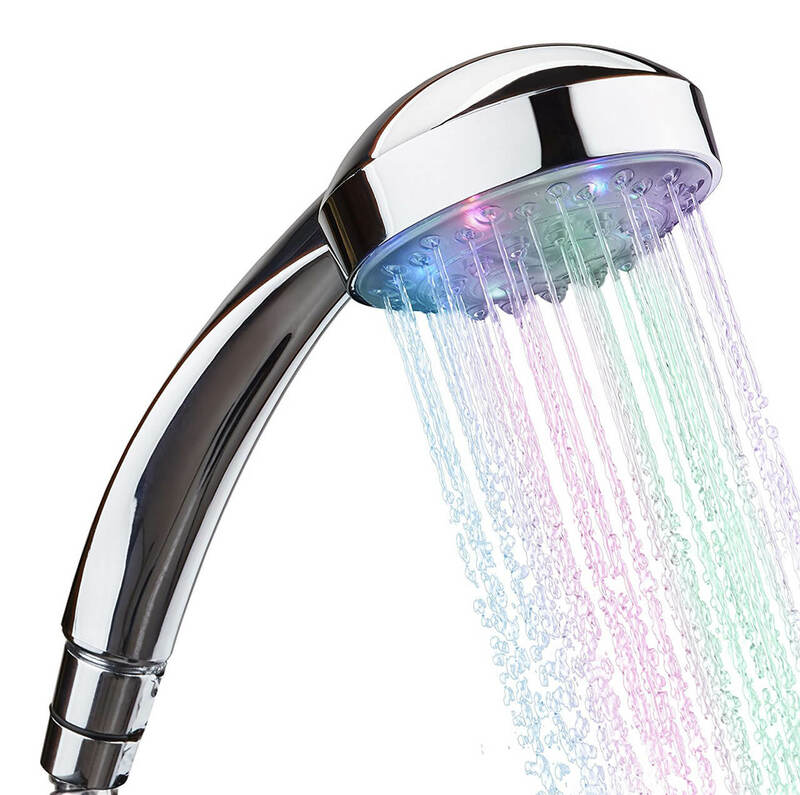 This LED shower head has 3 main light colors – green, blue and red in correspondence with the set water temperature and 4 other colors that it fades to when water temperature is changing. It installs easily, and the ABS has a modern silver plating. This 10-inch round, overhead rainfall shower is designed to extend from a bracket connected to the wall. This way, you can lower or raise it by 3 feet. 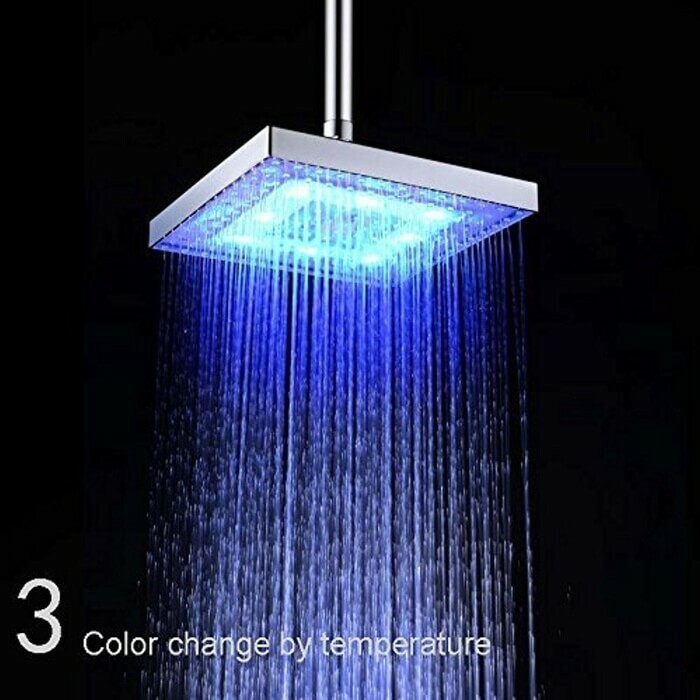 It also has a light up shower head, which displays one of three colors depending on the water temperature and flashes red when water may be uncomfortably hot. Water output is a maximum of 2.5 gallons per minute. This wall-mounted, 8-inch, round shower head has 5 shower pattern settings – Power Rain, Pulsating Massage, Hydro-Mist, Economy Rain and Water-Saving Pause. 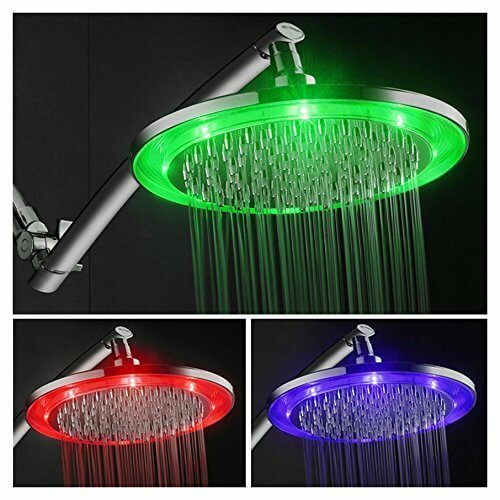 The whimsical bell-shaped light up shower head has LED lighting in three different mellow colors to go with the water temperature; there’s cool blue, warm green and steamy red. This 8-inch square shower head is a fixed overhead model. 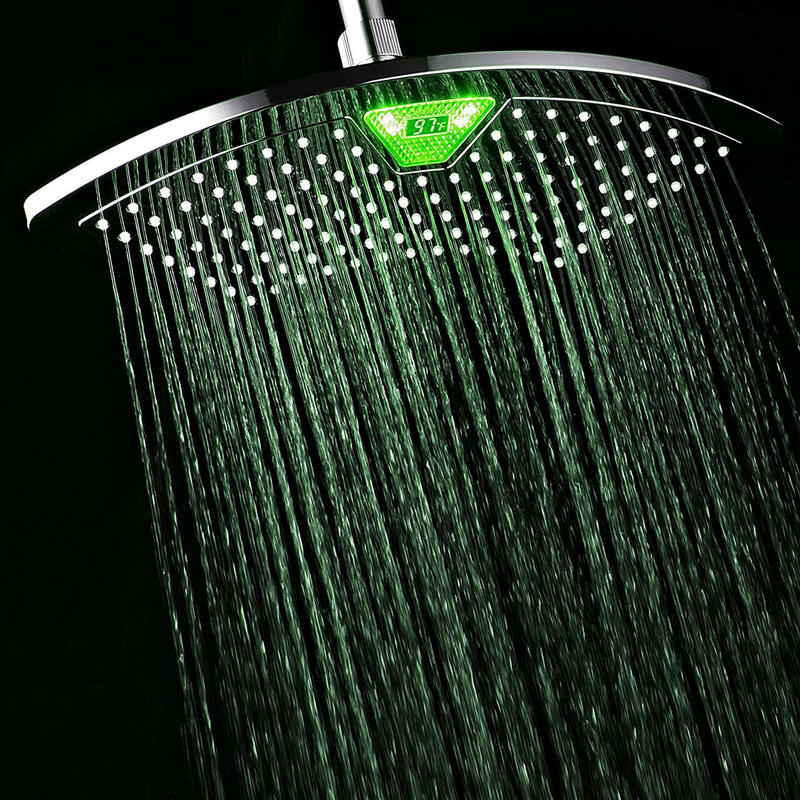 It has LED lighting that corresponds to the water temperature; so no more stepping into cold showers or wasting water. The shower head does a max water output of 2GPM or 2GPRM. Customers love the high but gentle water output of this lighted shower head, which allows for quicker and more stress-free showers. 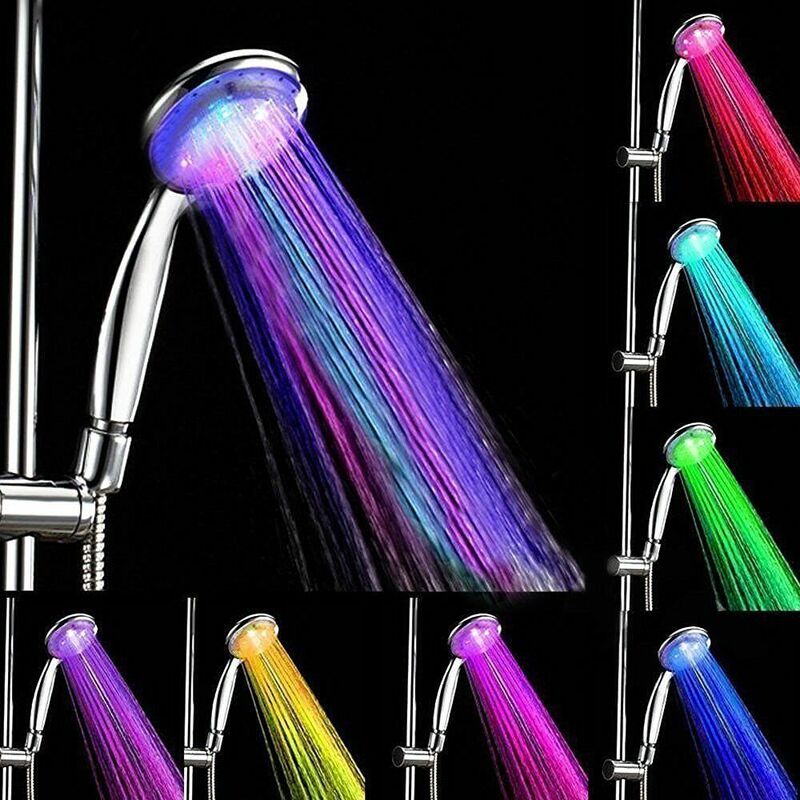 If you wanted to make shower time more exciting, then this color changing shower head will do the trick. 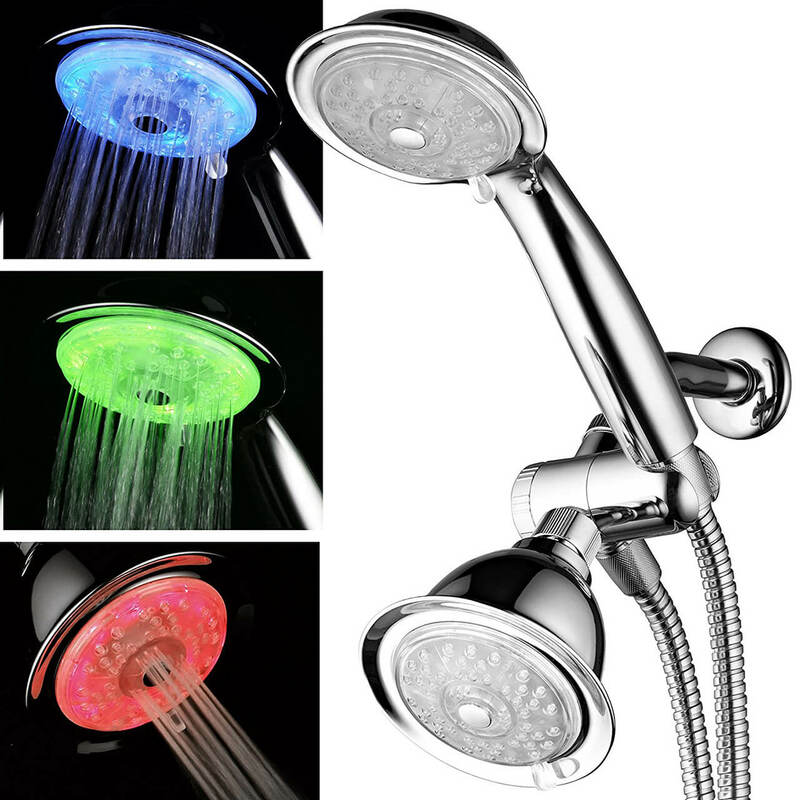 Every few seconds, the LED light emanating from the shower head changes giving you a steady color display while you shower. This is a great way to wind down or lift your mood. 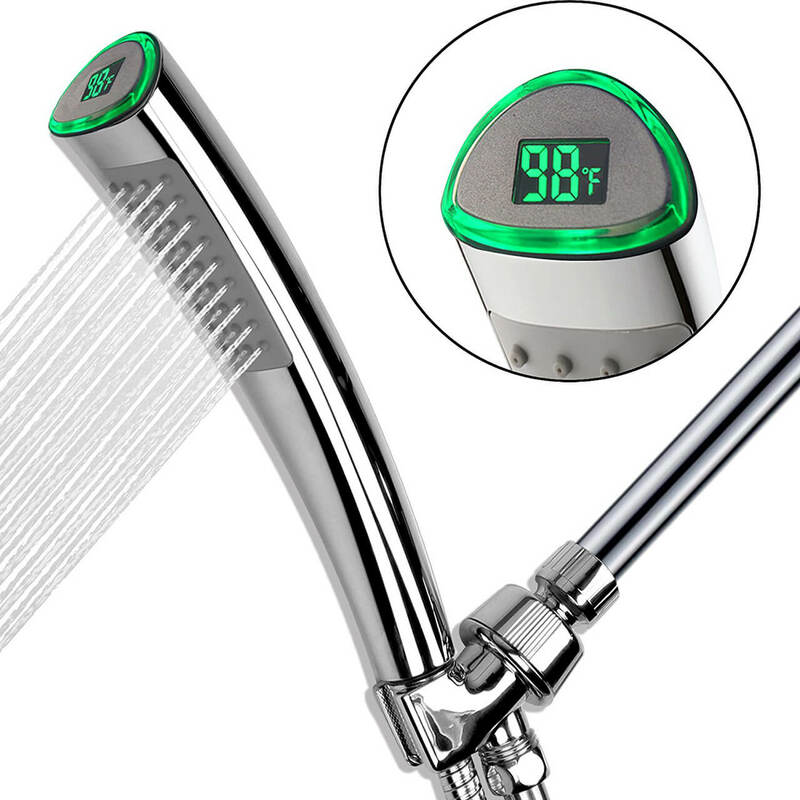 This shower head is compatible with most hoses and mounts. This massive shower head is made of durable stainless steel and has a rubbed bronze finish that gives it a majestic look. This luxury home decoration idea creates a nice full shower with great pressure and even water flow. The LED lighting on this one changes according to water temperature. Shower under a comparatively gentle water fall. This is even big enough for a couple to shower together. This stainless steel led lighted shower head has a chrome brushed finish. Romantic LED lights change color according to the water temperature. 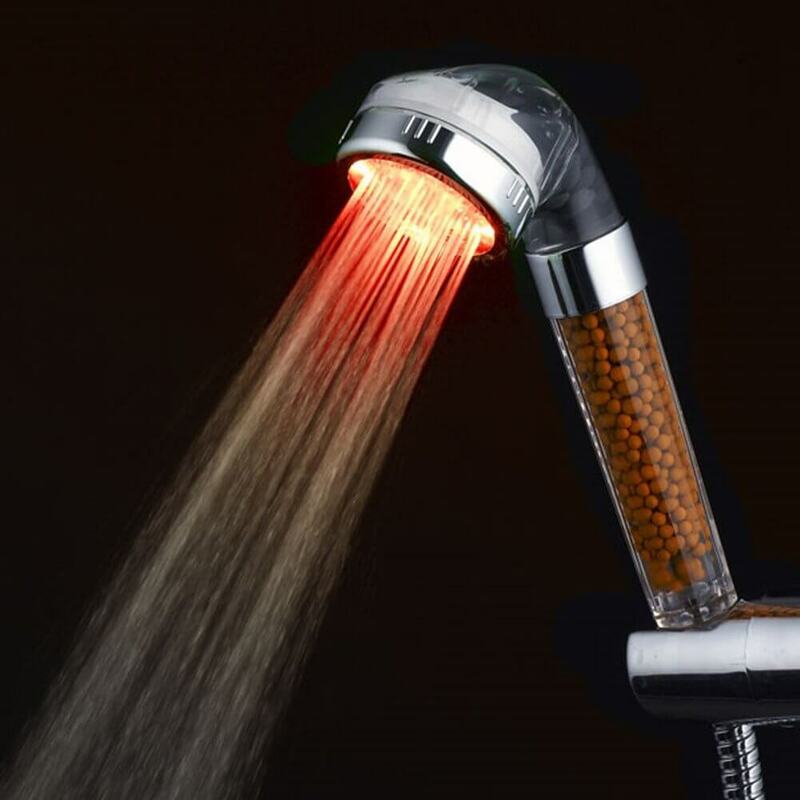 This shower head will be a novelty in your bathroom. 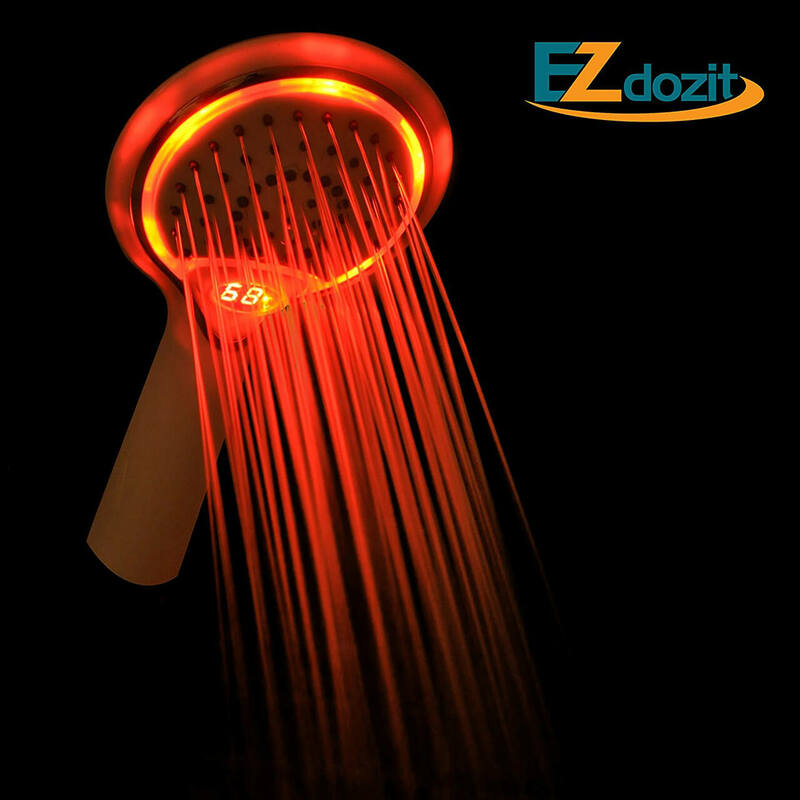 The LED lighting on this shower head gradually flows from one color to another and is not affected by water temperature. 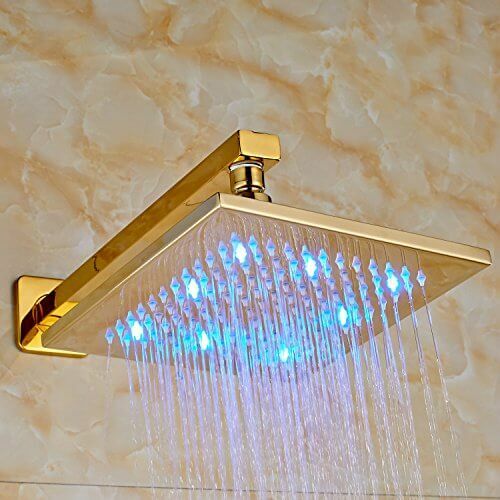 This is a wall-mount or handheld lighted shower head. It is made of durable ABS and has an ergonomic design. This is a brass shower head with a beautiful gold finish. It is a wall mount variety that sits overhead. 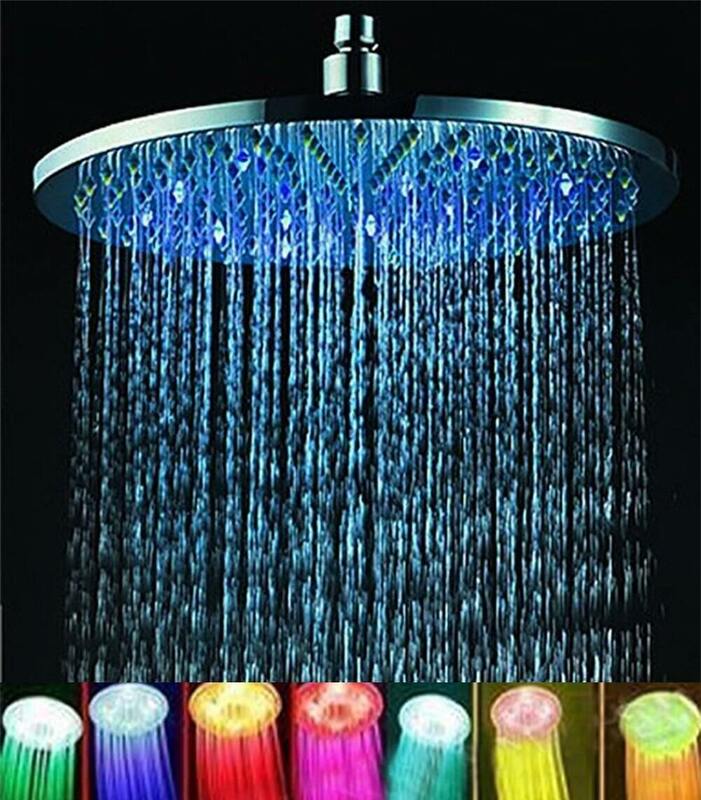 LED lighting comes on with the water and changes color according to the water temperature. This is a modern and elegant square shower head 8 inches in diameter. It’s sure to be a home decoration idea you won’t regret. 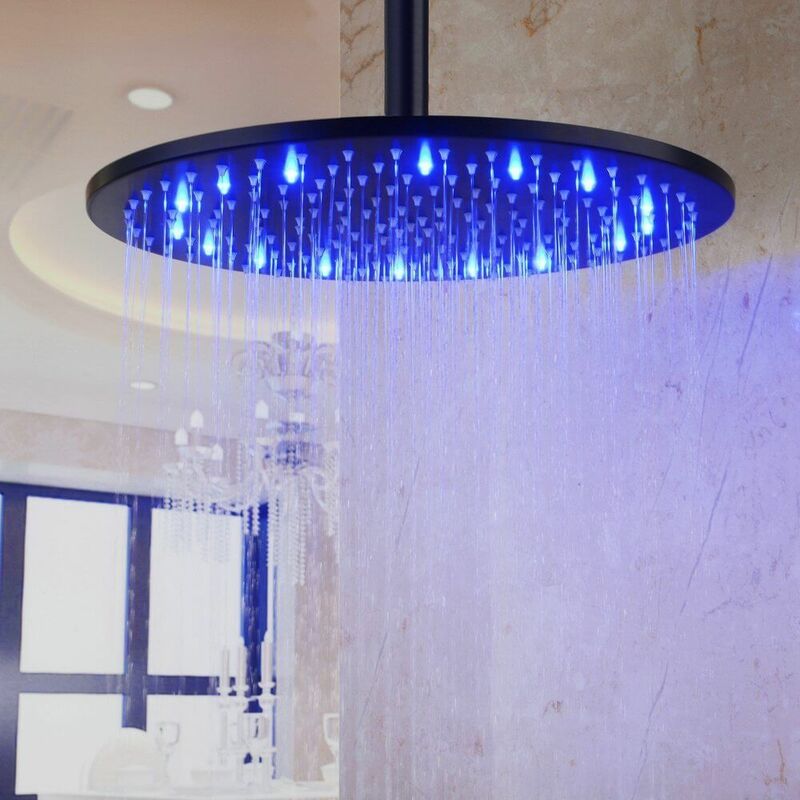 Almost any light up shower head from among these that you choose as a home decoration idea has the potential to allow you to cut down on your electric bill because you can cut the lights while you shower. As for your home decor, when not in use, they have you covered with their aerodynamic designs and sleek finishes. In the shower, everyone is sure to get mesmerized, rejuvenated and clean.